Check out Guardnacho’s alternative take on the geography of 7th Sea‘s Theah, particularly if, as the RPGnet poster put it, you like maps that reflect “basic geography concepts like water flowing downhill.” Thanks to Fiver for the link. That same thread also suggested that Theah could couple fairly well with Northern Crown, which is an interesting idea. Northern Crown is a alternate fantasy history of the colonization of North America. There’s magic, quasi-magical natural philosophy, strange creatures and wondrous civilizations to meet and it’s generally an accessible, fun though not necessarily light combination of early American history with the tropes of Dungeons & Dragons. I’ve written a bit more about Northern Crown previously. The unfortunate part about Northern Crown is it hit the market after the d20 wave crested and began to roll back. It’d been in publishing development for a long time — and had been a freely available thing on the early web prior to that — so when it finally got to the market, all anybody saw was another d20 fantasy campaign world with the usual smattering of additional classes and new magic items. Northern Crown never got a fair shake. The creator, Doug Anderson, is focusing on an introductory role-playing game for younger players called Dungeonteller these days, and some very cool isometric printable dungeon tile packs. He seems to have pretty much moved on from Northern Crown. Back in January, Atlas Games announced Battlefield Press planned to compile the setting material, adapt it to the Pathfinder rules and expand the game world to include the continent of Southern Cross. Battlefield’s own web site is silent on the project so far, but in the run-up to GenCon, I asked someone I think was associated with Battlefield via Twitter — certainly, he was publicizing a panel the company planned to hold at the convention — and the reply was the Northern Crown project was still a go, so far as I knew. I wish I could dig up the conversation, but my Google fu is failing me at the moment. So here’s hoping Battlefield Press sees this project through. And if not, honestly, it can run pretty well in Pathfinder without much more work. 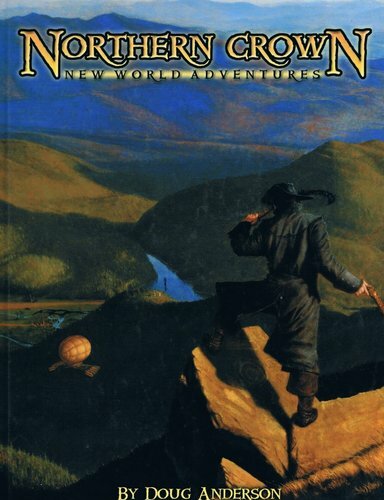 In this carnival of sharing our under-loved favorite role-playing games, I’d like to talk about Northern Crown. Picture a history of the world mostly as we know it, but painted with the palette of d20 Dungeons & Dragons. Amid the hardworking artisans and farmers of Uropa stride adventurers: trained soldiers, paladins of God, wizards and more. The powers of western Uropa have turned their gaze to the west, where a massive, uncharted land, called Northern Crown for the distinctive constellation in its night sky, has been found by explorers. Those Uropan nations have unsurprisingly taken to the prospect of new, open lands with alacrity, settling all up and down Northern Crown’s eastern coast. Of course, Northern Crown isn’t empty of inhabitants at all. Wild, fantastic beasts dwell here: catamounts, horned serpents, stony elementals, fairies and more. Moreover, people live here. The nations of the First Ones span the landscape, blending into the existing environment that most Uropan settlements don’t. As you can tell, it’s a match for the ages as the First Ones struggle against foreign interlopers in their lands. Anachronistic alternate history. Part of the world’s charm is it’s not only an alternate history of the world as we know it, plus magic, fell beasts and all that, plus it’s the greatest hits of renaissance/reformation Europe and colonial America. Fantasy Thomas Jefferson and Wizardly Ben Franklin lead a nation of freethinkers in the 17th century, while exiled King Charles plots against the half-fey Gloriana reigning over Albion. Humans only. The dominant sentient species in Northern Crown are humans. There are fairies and outsiders, but they start off as non-player races. There are no elves or dwarves, etc. Replacing the racial axis in the Cartesian grid system of character creation is culture. Players choose a culture in which their character grew up and receive feats and abilities based on what that culture values. Albions learn minor glamer magics, Vinlanders train for the life of a sea wolf and Sophians prize education and reason. Straddling the divide between medievalism and industry. True to its historical roots, Northern Crown incorporates advances in technology from the default pseudo-medievalism of Dungeons & Dragons. Firearms are relatively common, though the rules as written make them more of a pain than they’re worth, which is how I think the designer wanted them. The apex of melee combat is fencing, more intricately developed than the art of swinging a greatsword. Natural philosophers have begun to categorize and plumb the depths of phenomena observed in the world — they’re mechanically a kind of spellcaster that relies on specific tools, but the process and effects are wholly scientific. To the goal of getting Northern Crown into the game-playing public’s eye, in December I began the project of extracting the setting’s declared open content — so wonderfully much of it; indeed, nearly everything — and updating it to Pathfinder, presenting it in the style of d20pfsrd.com. You’ll find Project Boreas, currently a work in progress, available for perusal and populated with ever more material for exploring the lands of Corona Borealis. Updating the source material to Pathfinder has been interesting. So far I’ve focused on things that don’t need a lot of change. But I’m coming to the point where Northern Crown‘s unique classes — agent, natural philosopher, rake, raider, soldier and witch, namely — need attention. Sometimes, there’s a Pathfinder class or archetype that does most of the job, or there are already written class features that can transport over pretty well. The question is: when is it worth making a change to something already written? My own inclination is to change as little of the source material as possible. Let GMs and players make their own decisions. Some things, like upgrading a class’ hit die, are no-brainers. Northern Crown‘s unique classes also need level 20 capstone abilities. Other things, like the fencing rules, perplex me. They were written before the codification of combat maneuvers into CMB and and CMD rolls. How does one gauge the utility of a hilt smash or rondo against the venerable charge and bull rush? Plus, there shouldn’t be a feat to gain access to fencing moves. So either all the classes that get Fencing for free either need a new free feat, or that Fencing feat gives a CMB bonus to fencing maneuvers; CMB bonuses are reportedly rare as hen’s teeth in Pathfinder, outside the cad. I may like Pathfinder, but I certainly don’t have the level of system mastery to know when tugging on a string knocks down a load-bearing column on the far side of the rules complex. Fun questions, right? That’s what I’ll plug away at as I can for the next few months. Spending more time observing conversation on the Paizo forums has proven very instructive in getting a read on things that are considered vital, over-powered or lackluster in the eyes of forum-going players. All this game mechanic work is in service to running a Northern Crown game someday, of course; hopefully after we finish Carrion Crown. Picture it: the hard-set Free Republic of Vermont lies in the nebulous marches between Nouvelle France and Nieu Amsterdam, antagonistic Uropan powers, sharing that contested space with First Ones bands and the fantastic fauna of Northern Crown. After a rough winter, its citizens — some of whom may not agree that they “belong” to any such republic — need new leaders to succeed the aging Ira Cole, chief of the Green Mountain Rangers. Leaders who ought to be handy with swords, flintlocks and spells to defend their lands and neighbors. With the confirmation from Sean Punch that the contract for a new version of The Madness Dossier in some form has been signed and the resurgence of Conspiracy X material in recent months, the thought occurs to me that the two worlds would interlock rather snugly. AEGIS is a ready-made secret agency to drop in the place of Project Sandman. Its agents are already trained to cover up unknowable horrors. The Red King and its implications are right in their wheelhouse. In that way, the impending threat of History B slots right into the world of AEGIS. For a more integrated presentation, the irruptors match up fairly well with the Atlanteans. They’re still wielders of incomprehensible, godlike technology from another time, only that other time is now sideways rather than forward. Their objective is to reclaim their world, rather than ensure its existence. And like Captain Chronos and other inscrutable time travelers, that objective may be served by acts that work in harmony with AEGIS agents’ own as often as they hinder. And I write that lacking the full skinny on the Atlanteans, not having yet pored over The Extraterrestrials Sourcebook. Writing plot seeds is tricky. It’s easy to let yourself become repetitive. I find myself writing and rewriting them to stand out as unique. That’s why I so easily stalled on Plot-Seed-a-palooza. I do mean to get back to that someday. In the meantime, enjoy revisiting some previously published plot seeds. Beastmen of the North Country lurk in the dark, silent woods. The Ghost Writer finds herself compelled to fulfill the authorial aspirations of the long-departed. Lincoln’s Blood proves a turning point for secret histories and wars. The Roxbury House is a spooky old house inspired by pictures taken by a friend of mine. Slayers and ‘Busters brings together two monster-hunting franchises to amuse the spectator in the incongruities and similarities. Something in Lake Champlain Uses Bio-Sonar is a highly suggestive thought about the sort of marine life lurking at the edges of human activity. Starless takes the contracting universe seen at the end of season five of Doctor Who and adds archaeologists of true history to the mix. This Man draws on an urban legend to create an ally or antagonist based in the dream world. Turn Me On, Dead Man presents an alternate history in which the star-crossed fates of two Beatles puts the world in jeopardy. The Voynich Manuscript is one of those archetypal plot seeds that everyone takes a stab at. That’s just the start of a glowing introduction from Paul di Filippo to Matthew Rossi’s Things That Never Were, a collection of short essays that range across the fields of history, science and their pseudo-counterparts. In one, he cobbles together an expedition team including Ehrich Weiss, H. P. Lovecraft and Robert E. Howard among others who delve into the caverns of Pellucidar and Atvatabari to stop the dero threat once and for all. In another, he posits a war of espionage between Roger Bacon and Kubilai Khan, the greatest minds of the west and east, respectively. Every essay is a freewheeling mish-mash of ideas ranging from the ultimate fate of the Library of Alexandria — hidden in a dimensional fold by genius mathematician Hypatia — to a bevvy of potential causes of the Tunguska blast of 1908 — too numerous to sum up. Rossi pulls from a wide variety of esoteric source of information without much discernment. The writing of Theosophists are as much fair game as The Dictionary of Imaginary Places. In short, it’s a smorgasbord of ideas ripe for the picking for a role-playing campaign. As fun as Rossi’s rapid-fire, scattershot mingling of fact, fiction and supposition is to read and feel your brain prickle at the madness of it all, it can be daunting to pick out the one or two things one wants from an essay while the author pinwheels around, invoking as many geek touchstones as possible, particularly Lovecraft’s mythos. Rossi usually cites his sources, particularly with extensive quotes to set the stage, but I often found myself wishing for annotations expanding on a throwaway namecheck, references to other essays in the book — he often brings a name or topic up “as I’ve mentioned before” when they appear later in the book — and footnotes of further books to research. It’s fun, it’s readable and it’s so similar to some of the plot seeds I’ve written here that I think we’ve both drawn from the same inspirational well, the Suppressed Transmission column by Kenneth Hite. But that’s fine. There’s more than enough weirdness in the world for everyone to write about. And I appreciated being reminded about this book on a recent RPG.net thread lamenting the unavailability of unpublished transmissions; it was a lot like stumbling onto Suppressed Transmission‘s cousin and being just as enraptured. Things That Never Were is published by Monkeybrain Books and can be purchased on Amazon — and possibly conventional retailers; I didn’t check. Last week, I extolled the virtues of Suppressed Transmission, a cornucopia of mad and wonder plot ideas for the discerning GM. Chris Helton concurred. Jürgen Hubert started his “Where I Read” thread of the whole Suppressed Transmission corpus on RPG.net. Then the RPGGeek community chimed in. That constitutes grassroots movement, in my opinion. Now the movement’s come to the Daily Illuminator, Steve Jackson Games’ in-house blog. Phil Reed and Steve Jackson both articulate how much they’d like to publish the full collection and sum up who’s been talking about the transmissions so far. Hello to all of you who came to Held Action via that post! They also reiterate that it’s going to take sales of the two existing collections to show there’s a market for further such products. Again, my only stake in this is getting access to the Suppressed Transmission archive in some form or another. And that’s something of benefit to every GM who wants to inject some high strangeness into their role-playing campaign. Caution: this post contains spoilers for the Doctor Who episodes The Pandorica Opens and The Big Bang. For a very brief time during The Big Bang, an alternate history exists in which Earth is the only planet with life in a universe with no stars. The planet orbits the Doctor’s exploding TARDIS, which provides the light and heat that allows life to continue mostly as usual for the human race from the first century of the common era up to the early years of the twenty-first century. The wrenching change, a total event collapse that undid every moment ever, threw up anomalies, fossils from another history that one could say irrupted into the new, starless history. As the Doctor races around the British National Museum, you can catch glimpses of some of the oddities of this alternate history: dinosaurs in the Arctic, fossilized Daleks, penguins on the Nile and Egyptian pharaohs in Tibet. This universe isn’t very long-lived. As time collapses around Earth, protected at the eye of the storm, it’s probably no more than an hour or two, linearly speaking, from the TARDIS exploding to the brink of total non-existence. But in that hour, a whole history exists, one which happens to be riddled with anachronistic oddities and Fortean-like phenomena. Sounds like a setup for a campaign of reality detectives to me! The best part is it doesn’t even have to be a secret team of reality cops. In the Starless history, anachronisms are available for viewing in public institutions like the British Museum and American Smithsonian. Like the comic book version of Hellboy, where Big Red is a known celebrity, these oddities are part of history as humans know it. There’s no need for reality cops to skulk in the shadows, collecting artifacts and keeping them safe from public knowledge. Instead, the motivations are prestige for institutions providing backing, celebrity for independent oddity hunters, riches on the artifact market and satisfying insatiable curiosity about the seeming bizarre state of affairs of natural history. The emphasis is on humanity and playing with history as we know it. There may be a few offworld artifacts scattered around Earth, but they are remnants of the original timeline, likely fossilized and inert, like the Daleks on display in the National Museum. In the Doctor Who ethos, everything is ultimately explicable. What some call magic is highly advanced science — block transfer computation and quantum mnemonics are two convenient labels — which includes psychic abilities. So an ancient South American civilization ruled by a lineage of sorcerer-kings is plausible, but the sorcery will turn out to have been chicanery or misunderstood natural abilities. Starless is continually contracting. In the wibbly wobbly, timey wimey sense, it only exists for a few hours as the universe collapses, despite also existing for hundreds of billions of years in the linear sense. In Starless, the lost decade phenomenon is very real: humanity invented whole dynasties of rulers to cover the missing years for which no one could account, a la Kenneth Hite’s proposition of hollow history. Remember the changes that come from seeing no stars in the sky: lovers walk under the moon, lunologists give advice based on the phases and motion of the moon and one of Van Gogh’s most famous works is Moonlit Night. A couple weeks back, I made the trek down to Rutland for a friend’s Weird Wars one-shot. While not my first foray into “historical event plus supernatural or otherwise bizarre oddities” — perhaps the most notable being Crashing a Conference at Wewelsburg at TotalCon in February — this was my first outing with Savage Worlds, which, quite frankly, I was not psyched about. Savage Worlds is one of those systems for which some people really drink the Kool-Aid, particularly over at RPG.net: “Bloo bloo bloo, fast, furious and fun, bloo bloo bloo.” I found it difficult to believe any generic, multipurpose system could be so amazingly better than any other without a heaping helping of personal taste to shift the bias — and still do. Having now gotten two play sessions under my belt, I’ve got no complaints about Savage Worlds, but I don’t buy it’s so exceptionally better or faster than any other generic system of comparable complexity, a la Unisystem. The set up for game cast the players as the only members of an airborne infantry platoon that actually landed where they meant to after parachuting into occupied France in World War II. At first, there was much fun with missing leg bags, questions over which of the available characters we’d chosen had useful items, like a map or a compass, and the timely arrival of a German patrol. The GM’s love for Band of Brothers really shone through here. It was a very light, off the cuff evening, with forays into the extreme silliness that role-playing games engender so well. After seeing Nazis snarfled by a troll living under the village bridge, we got the low-down on the story from Madame d’Exposition, elderly keeper of tidbits useful to motley gaggles of itinerant adventurers: troll wakes up periodically; troll peckish for goats; once troll gets goats, it goes back into hibernation. A quick trip out to a local farm yielded the two worst goats twenty American dollars can buy in wartorn France: Herve and Rupaul. They sated the troll, but not before we got in some more Nazi-bashing. My mechanical engineer from Brooklyn got a solid eight to his body count, mainly by playing Bowling for Nazis with grenades. Simple and very straightforward, but immensely entertaining along the way, thanks to everyone having a good sense of humor about them. Crashing a Conference at Wewelsburg wasn’t part of my original game plan for TotalCon. I’m not sure what I intended to do Sunday morning instead. Maybe just kick around the hotel and read a book, or spend a disproportionate amount of time scrutinizing wares in the dealer’s room, looking for the odd stuff my own local store didn’t stock. While flipping through the book Saturday evening, though, I decided to jump into Charlton’s game. I had yet to play a game GMed by Charlton, despite knowing him from the New England convention circuit for three or four years now. What’s more, the adventure premise was brilliant: Infinity discovers a timeline in which Germany won World War II. A conference at Wewelsburg brings together all the top officials of the Third Reich, including Hitler himself. Infinity gives one of their officially non-existent ISWAT teams a three word mission: “Resolve the issue.” And much fun was had. Charlton once remarked to me that time travel games are easy. The GM gives the players too many guns and pieces of equipment, then lets them generate the tension tripping over themselves not to get caught by downtimers. With that in mind, I came to the table expecting a loose, freewheeling game. And that’s exactly what I got.